If you are a sun-seeking family then a baby beach tent is a must-have for the summer months. Baby beach tents aren’t just used at the beach. They can and should be used to protect your baby’s delicate skin any time you plan to spend a prolonged time in the direct sun. In this post we will examine why tents are the best way to protect your little one from sun damage, as well as compare our options to find the best baby beach tent for your family’s needs. We earn commission through our links. Please read the full disclosure. What is a baby beach tent? Baby beach tents are small tents designed to protect babies against sun exposure. Factors that differentiate baby beach tents from other types of tents include size, portability, breathability, UV resistance, and durability. Baby beach tents are designed with babies in mind but some are large enough to accommodate larger children or even entire families. Is a baby beach tent right for you? How old is your baby? According to the FDA, you should not put sunscreen on children younger than 6 months old. If your baby is under 6 months you should use other forms of sun protection, such as a baby beach tent. Do you have more than one child? If the answer is yes, you may consider purchasing one tent that is large enough for the entire family. If you plan to breastfeed you may want a tent that can provide some privacy. Some beaches have biting flies. Many baby beach tents have a zip net which can protect against mosquitos and other pesky bugs while still providing UV protection. If you are worried about bugs, you may consider a baby beach tent under a beach umbrella for the rest of the family. How old should a baby be to use a baby beach tent? Babies are constantly growing and begin to crawl as early as six months. Some parents are concerned that their baby will outgrow their beach tent shortly after they purchase it. If you have a baby near the end of spring or beginning of summer, you will have plenty of time to make good use of your baby beach tent. It is generally recommended that baby beach tents can be used for children under 3 years old. A baby should never be left unsupervised in a beach tent. This baby beach tent is foldable, portable, and lightweight. It has a completely enclosable zip screen plus two plastic anchoring nails. Pop-up system. ⛺️ Made of Nylon which is naturally lightweight and durable. Larger beach tent made specificially for babies. Able to zip closed for full sun protection. No screen on the zipper door. Durable, lightweight, portable and comes with two anchoring nails. Pop-up system. ⛺️ Larger tent to accomodate twins. ⛺️ No zipper screen so not able to protect from bugs while maintaining breathability. ⛺️ Not large enough for adults so unable to breastfeed in privacy. ⛺️ Does not come with a cushion bottom for a baby only beach tent. Large tent able to accomodate infants and toddlers. Pop-up system. 4 tent anchoring nails. Built-in mosquito netting. ⛺️ Large enough to accommodate an adult so you are able to breastfeed inside the tent. ⛺️ Has four anchoring points so better protected against wind. ⛺️ You can get more use from this tent as your baby grows since it is much bigger. ⛺️ Comes with lifetime warranty. ⛺️ Many customers report it heating up in the sun quickly. Large family sized beach tent. Fastest and easiest beach tent setup on the market. Four point anchoring system to provide protection from the wind. ⛺️ Large enough for the whole family. ⛺️ Lightweight, portable, and breathable. ⛺️ Super easy to assemble and disassemble. ⛺️ Has a 1 year warranty. ⛺️ Very large so not easy to carry if you have children and other beach equipment. Lightweight, portable, easy to assemble family beach tent. Durable and long lasting quality. Uses sandbag anchors. ⛺️ You will have to move beach chairs as the sun moves and changes the direction of the shade. We took our son to the beach as early as one week of age. 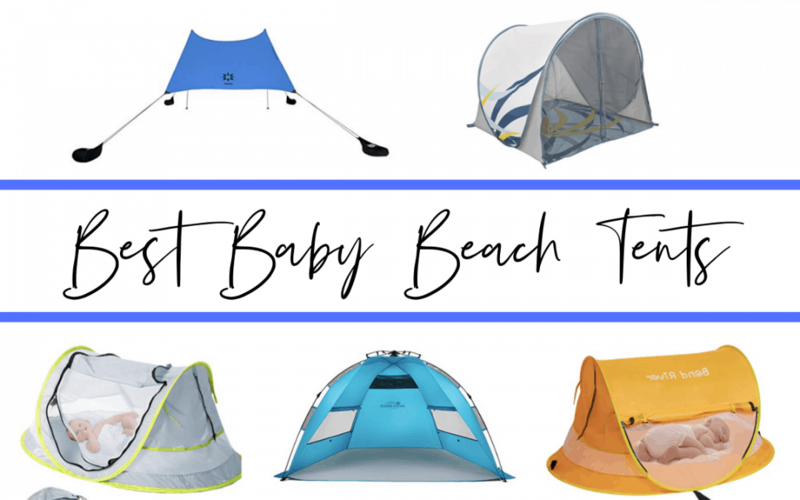 We go to the beach all summer long so researching baby beach tents was high on my priority list which I was chosing baby items. After considering the market options, we opted for the Neso family beach tent. We wanted a the UV protection and product that stands the test of time. Another important consideration for us was the weight and portability of the beach tent. Going to the beach with children require a lot of supplies and planning so a large beach tent was out of the question for us. What we love about our Neso tent is how lightweight and small it packs down. You can easily fit it in a suitcase and bring it with you to beaches all over the world. 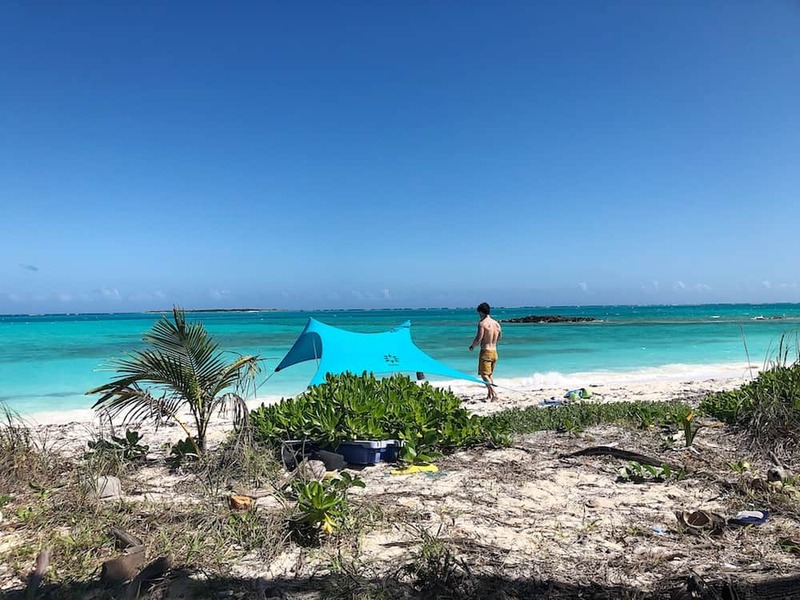 We took our Neso to Exuma bahamas for our family vacation this year and it was perfect. What Beach Tent did you pick? Are you using your tent for a family vacation or just some fun time in the backyard? Remember babies younger than 6 months old shouldn’t wear sunscreen. Always supervise babies in the heat of the summer as they can become easily overheated and dehydrated, even when under a baby beach tent. I hope this review helped you decided which tent to choose for your family! Let us know what you think?